What would you do with a bottle of the cheapest scotch whisky money can buy? Well, I though about just throwing it by the sink but then you won’t be reading this awesome investigation article. I could have throw it in some connoiseurs blind tasting but they would hate me for that. So I decided to use it to do a better-than-the-original whisky liqueur. So how do you do a whisky liqueur? It is easy! Just add honey, lots of honey and spices and fruits. Sounds easy? Well, I have to say that my respect for liqueur brands has increased as a direct result of my learnings with this experience. It isn’t so easy. As I didn’t have any recipe in mind and I was just playing I decided to create four different recipes and choose the best from there. Nose (83): more than average. oranges, honey, floral, cardamom, spices. Palate (80): powerful. honey, orange, cardamom, floral, spices, wood. Orange and cardamom are overwhelming. Finish (80): average. orange, cardamom, floral. So based on other whiskies I have already tasted I rate this Experiment 2Na+2Ca with 81 points over 100. I want to play safe so what about if is it too much orange peel and spices? I created this version with half of everything. Nose (84): more than average. honey, floral, citrus, cardamom, cinnamon. Palate (79): powerful. honey, cardamom, floral, spices, pepper. Finish (80): average. cardamom, honey, floral. So based on other whiskies I have already tasted I rate this Experiment 1Na+1Ca with 81 points over 100. Ok, but what if orange and cardamom wasn’t the way to go? I decided to create two spin-off, this one using raisins and PX sweet syrup. Nose (88): more than average. honey, nuts, raisins, sherry, floral. Palate (83): powerful. honey, raisins, floral, chocolate, dates. Finish (83): longer than average. honey, raisins, chocolate. So based on other whiskies I have already tasted I rate this Experiment 10Pa+PX with 85 points over 100. And just to be safe I found the very best whisky liqueur on earth I have done another way with vanilla extract. Nose (87): more than average. honey, vanilla, floral, spices. Palate (84): powerful. honey, vanilla, floral, spices. Finish (83): longer than average. honey, vanilla. So based on other whiskies I have already tasted I rate this Experiment Va with 85 points over 100. Making whisky liqueur isn’t as simple as it sounds and in all the cases the stuff wasn’t looking really nice. It was cloudy with fragments floating around… I would return a drink that looks like one of those. 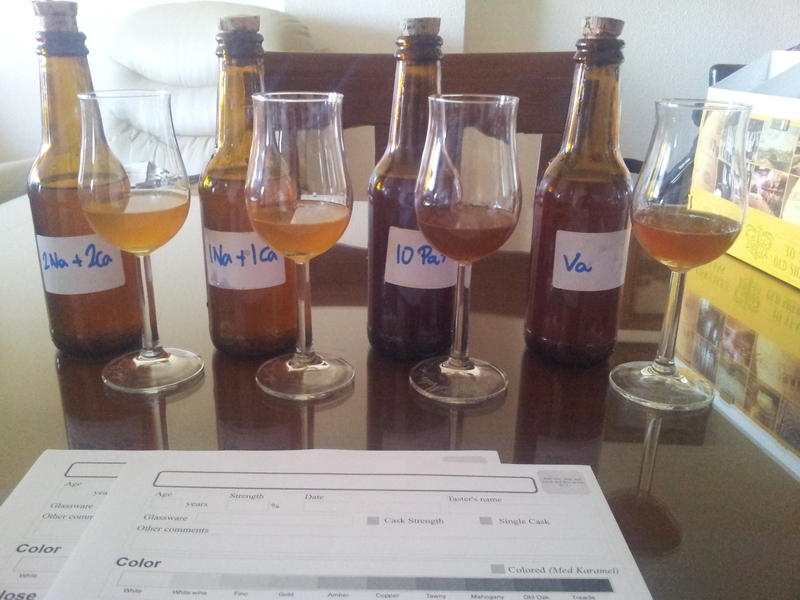 I have to dilute the resulting whiskies just to see how it behaves once it is softer as right now the aromas on the four experiments are too concentrated. So don’t miss the next post about chill filtration and how diluting it in even worst whisky will made it better… or no.